I’ve often heard Asturias described as ‘Wales on steroids’. The truth of this really came home to me one day when I realised that the ‘wee hill’ behind Nava in the Comarca de la Sidra is actually higher than Snowdon! 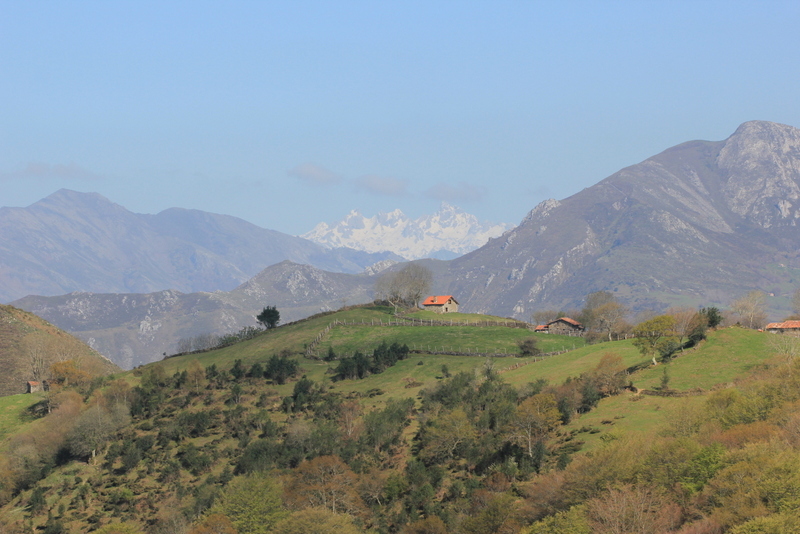 Dwarfed by its imposing background of the mountains of the Cordillera Cantábrica and Picos de Europa it may be, but Peña Mayor is a beautiful mountain in its own right and is criss-crossed with great hiking and biking trails to explore and from where to drink in the stunning panoramic views. On a clear day you can see as far as the sea to the north and to the south its snow-capped sisters are almost always in view, although ever-changing according to the varying light of different times of day and year. Peña Mayor actually straddles four counties; Nava, Piloña, Bimenes and Laviana. On the Nava side of its slopes lies the open expanse of Les Praeres, easily accessible via a 4km track that ascends steeply from the village of Piloñeta topping out at the famed bar-restaurant. A unique establishment, Bar Les Praeres is off-grid and chock full of authentic rustic charm, as well as having views to die for. On weekends it does a splendid barbecue with meat often supplied by local hunters. Great for replenishing energy after a day spent exploring some of the many trails that set off from here. Although if you get too friendly with their adopted resident deer Bambi then you may find the meat grill losing its appeal…. This year, on September 8th 2018, Les Praeres will host a stage finish of the prestigious Vuelta a España, bringing its charms to the eyes of a wider international audience with the televised footage. But for a sneak preview and a proper bird’s eye view of it check out this drone footage from Turismo Asturias. If you like what you see and you’re interested in grabbing yourself a more permanent slice of Peña Mayor then we can help you. We have cabañas for sale in various locations on the mountain itself as well as houses in nearby towns, villages and countryside. Contact us with your specific requirements and soon you could be hiking these trails whenever you want! Read their beautifully written story here – and get inspired! 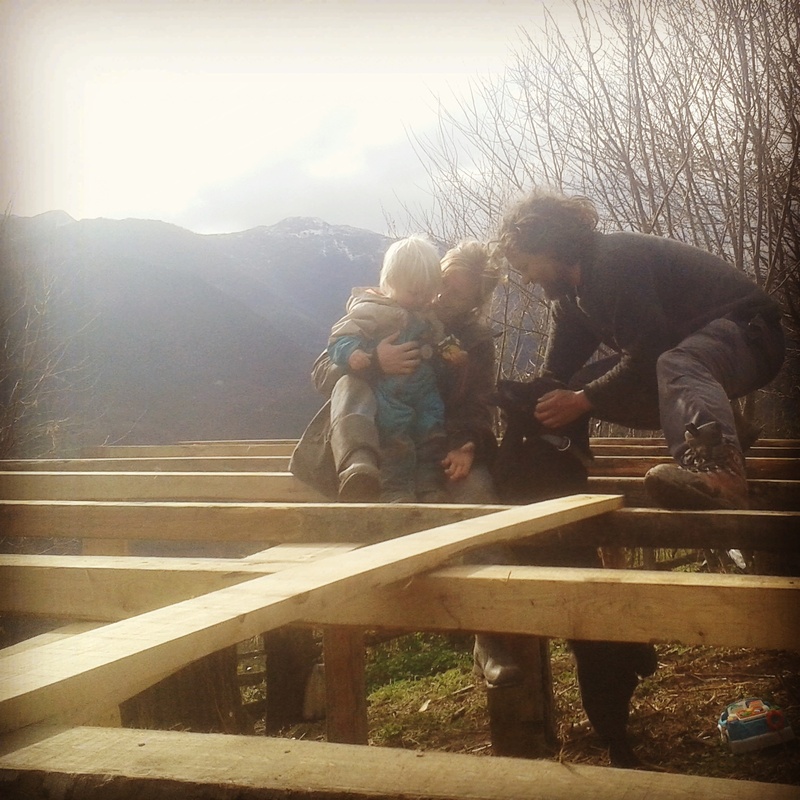 We are Signe, Tarje and Roar, Danes and recent homeowners in the rocky part of Asturias; Quiros. We met Mary more or less by chance after having spent half a year on the road with our baby Roar. Before that we were working as respectively an academic and a nurse, but we have always had that nagging feeling that fulfilling the ideals of society was properly not the road to meaningful and happy lives for us. The courage to do something about it, however, only came with parenthood. And while it does take a lot of courage to break away from your routine, we have learned along the way that the shackles don’t just fall off simply because you start to rattle. We had an idea that we wanted to find a place in Catalunya – and start building towards self-sustainability. However, while Spain is littered with old ruins in need of love – finding a suitable one for sale turned out to be an insurmountable task. While we liked the experience, Catalunya seem to be hit hard by drought-spells and increasing heat – and didn’t really feel like home to us. With a few rock climbing images from Asturias, our heads turned west, and the lushness here immediately felt right. It is only after you have gone through the process yourself you realize how much work Mary has put into finding properties suitable for expats. Mary calls herself an estate agent, but we feel a more descriptive title would be ambassador. Of course she runs a business, but you can immediately tell her main focus isn’t improving her own margins, but bridging the substantial cultural gap it is for northern Europeans to buy property in Spain. One show of the abandoned village Eros – halfway up a mountain – and we were sold. We are now a few months in, the house seems to have stopped crumbling down – the once omnipresent brambles are starting to reappear less and less and we are making the first moves at making our house liveable and our garden edible. If you’re a regular reader of our blog you may already have met Mick Wyldbore-Wood as he previously shared his experience of buying a house through us. Well, it’s not quite a year since he completed his purchase and last week I was thrilled to see via Facebook just how much he and his family are enjoying their new property in Asturias. A half-term break in February might not sound like the most promising time for a holiday in northern Spain but parents can’t be choosers. The Wyldbore-Woods are an intrepid bunch anyway and wouldn’t let the potential for some wintry weather put them off – in fact, they came fully equipped for skiing and hoping for snow. The mountains didn’t let them down and they managed to check out the three (yes, three!) nearest ski stations on different days and much to the kids’ delight. Best of all they got to intersperse their days skiing with days at the beach soaking up some glorious winter sun in temperatures akin to a fine British summer’s day. With the mountains and the sea within an hour and a half’s drive of each other in Asturias, it’s a great combination for active holidaymakers. It’s even perfectly possible to ski and surf in the same day if you’re feeling particularly energetic! It certainly means you can cram an awful lot into a relatively short holiday and that’s before we mention the wonderful regional cuisine. Mick and Claire were lucky enough to sneak in a romantic Valentine’s dinner at the Michelin-starred El Corral del Indianu in Arriondas. Definitely one for the bucket list. Big thanks to the Wyldbore-Woods for sharing their fab video of their half-term break in Asturias with us! 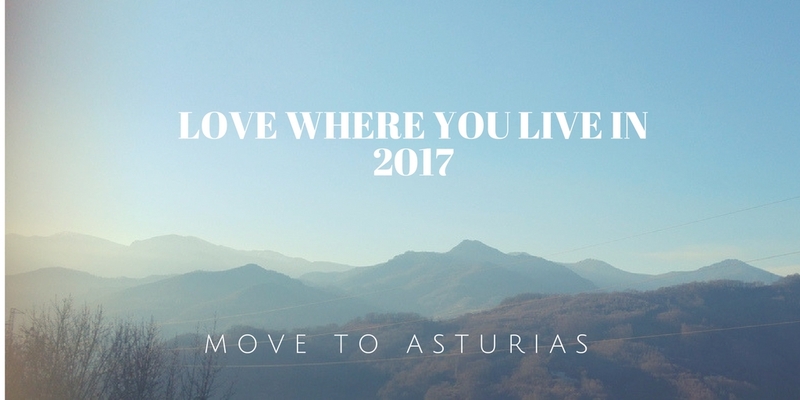 How much does it make you want your own holiday home in Asturias?! Dave and Anna Renner are a young British couple who got in touch with me in autumn last year looking for assistance in finding their ideal property here in northern Spain. They had already been searching for some time when they had the good fortune to meet some former clients of mine who are currently renovating a house they bought through me in Cantabria and they recommended they contact me. Below, in their own words, is the Renner’s experience of house-hunting with Spanish Property North. Mary made our property search relaxed and enjoyable, when previously it had been quite a frustrating process. She had a long discussion with us about our requirements, and had a good knowledge of our search area, meaning she was able to quickly narrow down the search to properties that matched our criteria and budget. Unlike some agents we had worked with in the UK, she didn’t waste time showing us unsuitable properties, and she was also very easy to contact and get information from. We were looking at properties all over Asturias, and Mary took loads of time driving out to meet us at various remote locations to investigate potential purchases. Once we’d decided on a property she managed everything to make the actual purchase process easy. She also acted as our translator with the Notary and the Vendor during the completion meeting, making sure we understood the contract and patiently going over clarifications and corrections to the deeds. She was really great with little details that might have tripped us up, like helping us get our NIEs and making sure we opened a non-resident rather than resident bank account, which would have caused problems on completion day. Overall it was a really positive experience and if you are looking for property in the area we would definitely recommend contacting Spanish Property North. It’s January 1st 2017 and this is the view I’ve woken up to. Today the choice is between mountains or beach and my seven year old has spoken and decided on a hike and a bike ride, so mountains it is. The sun is shining and the sky is blue, as they have been all of this Christmas holiday. I could not be happier with where I live. Will 2017 be the year you make a move and seek out your own piece of paradise? Wishing you health and happiness for the new year. For a lot of our clients the dream is to buy a traditional property and renovate it, often with the aim of ending up with some tourist accommodation to let out as well as a family home. It’s a dream we can relate to perfectly, having started out from that very same place ourselves over 11 years ago. It’s also a dream we can help turn into reality as we’ve done exactly that for ourselves several times over as well as helping countless clients along the path to their own little piece of paradise. If you’d like to know a little more about our own latest renovation project and the resulting holiday rental then check out this neat video we made. There’s some pretty cool drone footage of the mountains of Central Asturias in here as well as shots of our traditional Asturian house and holiday rental and some talking heads interview with us, as well as our ‘celebrity’ guests, North Face athletes and world-class rock climbers Caroline Ciavaldini and James Pearson. And, of course, if you’d like to find out more about the realities of buying, renovating and renting out property here in Asturias then please do get in touch!